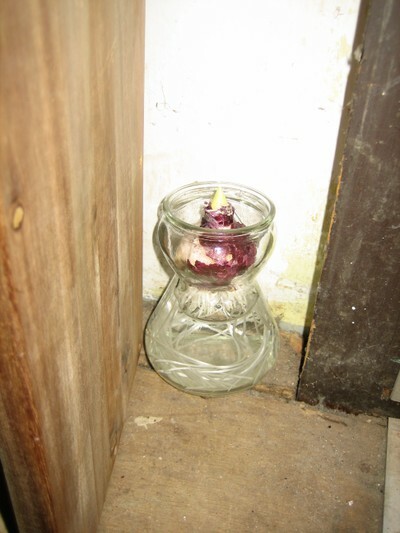 I have a post in my head about my indoor gardening endeavors, but haven't found the time to actually take the photos I need for it or type it up. But on the bright side I've been done shopping and wrapping for ages (or one week which feels like ages when you're staring at all the wrapped packages under the tree). Merry Christmas all! I think I've already mentioned that another benefit of staying home for Thanksgiving this year is that I got the calendars done really early. It was a great year in the garden and we think this year’s calendar reflects that. I tried to feature photos in the month they were taken, but couldn’t quite do it. 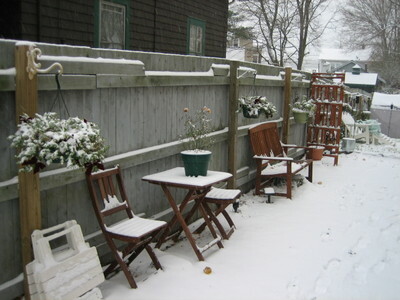 All photos were taken in 2010 and with the exception of March and July, all in our garden, or at least on our street. Stick around to the end and there will be information on purchasing a calendar of your very own! Now the pitch -- each year people tell me I should sell the calendars, so I figured, what the hell, why not actually put some products in the CafePress store I created years ago. So if you'd like to purchase calendars (or note cards) head over to my store and buy away. I can tell you from personal experience that the calendars make excellent Christmas presents! It will come as no surprise to regular readers that I compile a calendar each year using photos I took in the previous year. I'm holding off sharing this year's calendar until the recipients have had a chance to open their packages -- in the mail now folks, hold on! But I did want to share two things. First, Garden Rant has kindly compiled a list of garden-related crafts available for purchase (like calendars and note-cards) here. When they asked for submissions a short while ago I decided that it was time to actually stock the CafePress shop I created years ago. Be forewarned that if you click overto the CafePress shop you will see this year's calendar and ruin the surprise, mom and dad! But there are some nice note-cards for sale there that would make good holiday cards. The other thing I wanted to share with you is my current decorating project. I still have to clean my bedroom and get all my clothes organized. The only surefire way to get me back there is to start a project in the room so I'm in there during the day instead of late at night (when Lee really doesn't like me bombing around, he has this strange need for sleep). Which brings me (slowly) to the titular leftovers. We've been emptying the fridge bit by bit of leftovers. The pork-loin yielded two meals, one of which was pork-fried rice -- yum! But these leftovers are the portrait-oriented photos from the past few years that I love, but couldn't work into the landscape-oriented calendars. I haven't quite decided if I will hang all 12 or not. I'll probably wait to see how they print on my new wireless printer (switch if you haven't already -- I feel so liberated!) before deciding if all will go up. And they will be over the bed in place of a row of framed Dali postcards. I love the postcards because I bought them, the frames, and the black construction paper they're mounted on with my sister years and years ago. 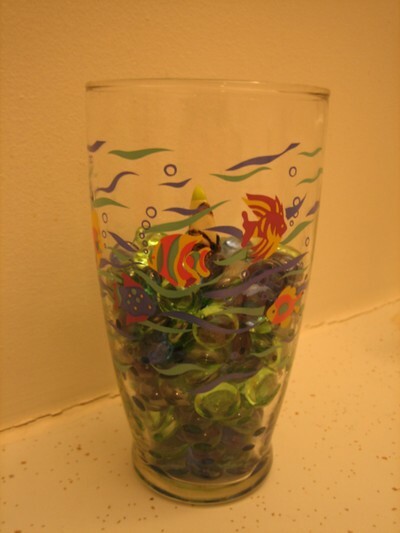 I remember that great day of shopping and crafting when I look at them, but I think it's time for a change. I might find another spot for one or two of them, but I will definitely be keeping them all. I will share more as this project progresses, including how I am going to manage hanging all those little frames in straight rows! I think I see a few I'll eliminate right away! Thanksgiving was wonderful and we've been watching a Christmas movie (or TV episode) a day since then. Tonight a friend and I went to another friend's caroling group's concert which was a lovely way to start off the Christmas season -- friends and family, that's what it's all about! IS IT ANY LESS JOYFUL BECAUSE IT'S CHEAPER? Some years the Christmas card list is short, oh who am I kidding? Some years I haven't sent any at all. This was one of those years where I bought a package of 20 cards, wrote up my list, made out all the cards, and then figured out that I had left off 3 very important people. Guess who's going to buy a cheap box of cards tomorrow? Ugh! Tonight I spent a few hours writing out the cards and wrapping the calendars that I'm giving out. We started out the evening watching National Lampoon's Christmas Vacation (because who doesn't feel better about their holiday plans after watching that movie?) and I just kept wrapping and wrapping. After the movie younger step-son (who is now living with us when he's not at college, which is a joy) started playing Halo. So this year Christmas presents and WARTHOG! will be inextricably linked in my mind. 2008 finds us still celebrating Christmas, but in a much more conservative manner than last year. The economic downturn hasn't directly impacted us, but having 2 kids in college at the same time has. I've said several times to VPH this fall, "Thank goodness we have no money or we would have lost a bunch of it." 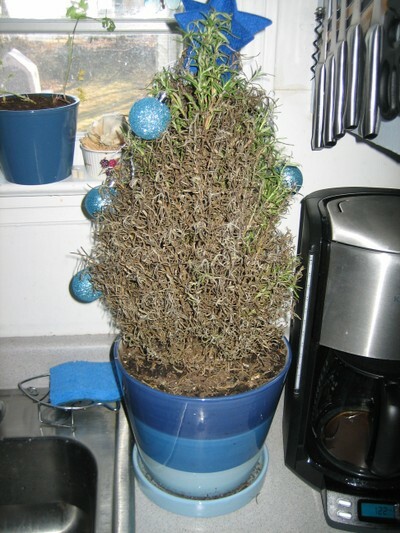 Long story short, last year we spent almost $70 on a living tree, a bunch more on a rosemary tree and a lovely poinsettia from the good nursery, and I forced bulbs all over the house. 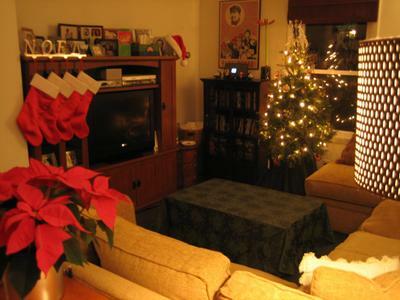 This year we have a $15 fake tree and 2 poinsettias that were a total of $6.66 and that is it. There isn't another plant in the house (other than one really old houseplant that we inherited from my mother-in-law years ago). 1. 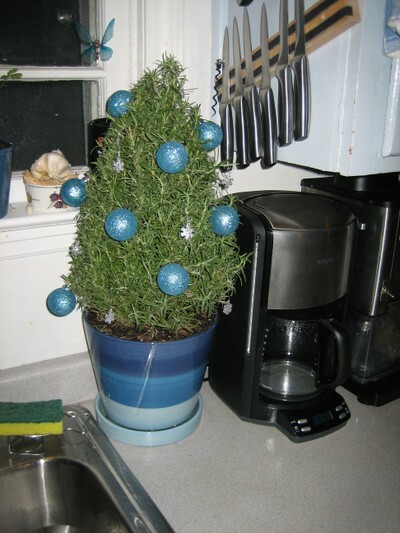 The $15 Christmas tree...better than you thought, isn't it? 2. Younger step-son's feet...anyone surprised he's over 6 feet tall? 3. The Wii Fit in the gaming section of the entertainment center...one of these days I will get around to trying it. 4. Halo on the TV...you know you're jealous! The calendars will be in tomorrow's outgoing mail so I should be able to share the final photos with you on Christmas day. Until then, best wishes for sanity in this, the most stressful time of the year! Santa was very good to us all this year and I ended up taking a little more of a vacation that I had planned on. I did save vacation time so I didn't have to work between Christmas and New Year's, but I also took a break from showering, getting dressed, and leaving the house for most of that time too. Blogging didn't even rate on the list of things I should have been doing! VPH gave me Super Mario Galaxy for the Wii (among many really nice gifts), so we all kind of knew I'd be unavailable for a while, but I sort of underestimated the degree to which I would become obsessed. I beat it and then I started over again from the beginning. Thank goodness I have to go back to work in a few days or I might be lost forever! 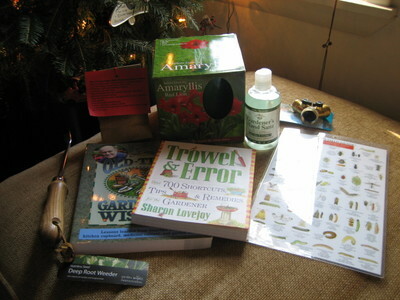 There were many wonderful presents (and I am very difficult to shop for, I don't give lists and I'm really picky), but I thought you might like to see the ones that are garden-related. 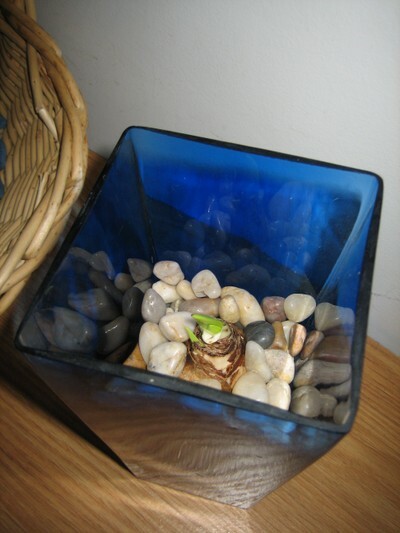 VPH told me just before Christmas how much he's enjoying having live plants all over the house. Truthfully, I think he's enjoying this gardening thing as much as I am! The tree is holding up great with just one watering a week. I'd planned to put it outside on Wednesday, but we're getting a really cold spell right around then, so I think it will live in the living room for a week or so more. I swear to God I watered it properly. 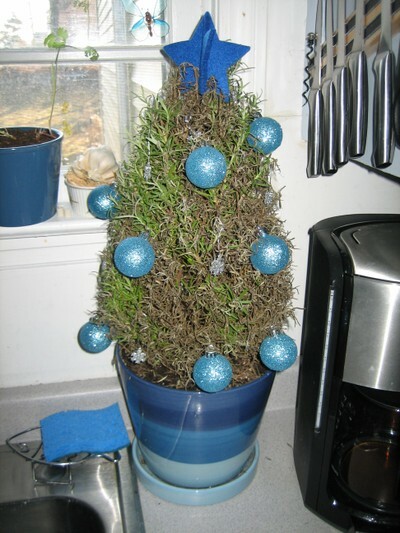 I am definitely bringing back this $30 tree and insisting upon a refund (or I might try one of the rosemary topiaries instead -- yes, I am an idiot). 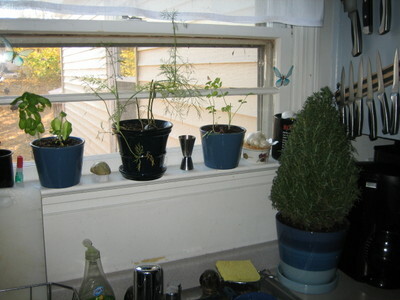 So it was a lovely holiday all around and with the exception of the rosemary tree, things are growing right along. Hope you all had as nice a time as we did! WHAT? YOU DIDN'T RECEIVE YOUR INVITATION? Last night VPH and I hosted our first annual holiday cocktail party -- first annual because we enjoyed ourselves so much we have decided to make it a yearly happening. I took a few minutes before our guests arrived to follow Chris's advice on how to take good photos in low light. Tucking in my elbows and holding my breath definitely helped, but I still think I need a better camera to be able to take photos as incredible as hers. 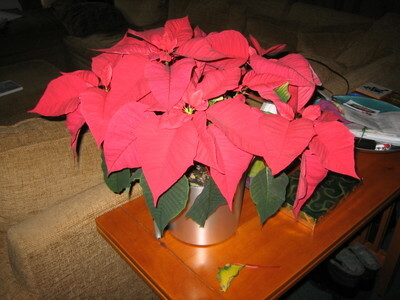 My favorites things about the above photo - the funky shade on the floor lamp on the right, the beautiful poinsettia, and the amaryllis trying valiantly to bloom in time for our company. I must confess I photo-shopped out the names on the stockings (I'm really Heather, but VPH and the step-sons insist upon their privacy). Helpful hint for those of you with padded top ottomans - have a piece of plywood cut to 1/2 inch wider than the top of the ottoman. 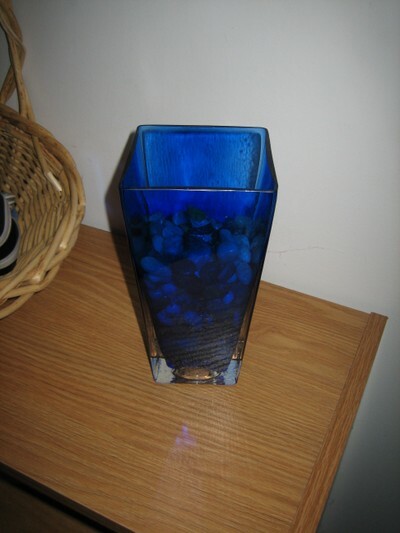 Place it on top of the ottoman with a tablecloth over it and instant table. 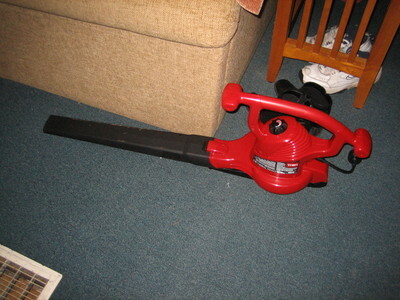 Simply slide the plywood under the couch when not in use. The flash makes it look so flat and colorless. This is the first year that I've tried putting the cards up on the door. I used 3-inch wide wired ribbon on the door and stapled all the cards to it. I tacked the ribbon on the top and bottom of the door with thumbtacks. Now, I'm a really tired puppy (the cold hit me hard on Tuesday - Thursday with a slight improvement on Friday in time for the party) and I'm going to spend the rest of the day relaxing on the couch. Hope your holiday prep is going smoothly! For about an hour today we had an honest to goodness snow storm going. For the rest of the day we had a sleet storm, which is more the norm here along the CT shoreline. 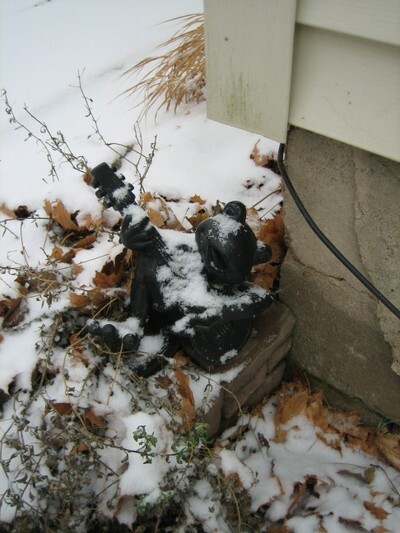 So I decided to take some photos of the pretty snow -- our first of the season -- while it lasted. Can you see where I'm going here? Bare hands holding a metal camera in the middle of a snow storm -- not the brightest idea I've ever had. 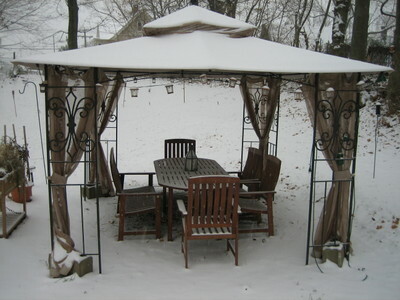 The manufacturer recommends that you take down the canopy too, but there's no way we were going to do that. The snow must have been blowing sideways to coat the table and chairs. Now I'm going to have to wait for the snow to melt and a couple of warm days to dry out the screens before I take them down. Let's start a door decoration meme. 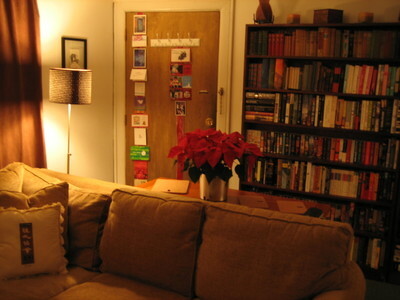 Post about your door decoration (or lack thereof), link to this post, and leave a comment saying you've written about your own door on your blog. I can't wait to see what you've all done to your doors! This is definitely our favorite time of year. We have a strangely large collection of Christmas CDs -- disproportionately large in fact. VPH has enough Christmas ties that he wears them from the day after Thanksgiving through Christmas day. Needless to say at least one of us was excited to decorate the house for Christmas. I'll give you two guesses which one. Of course that photo was taken on November 5th so other things have changed. The blanket on the couch has been relegated to the guest room and a lovely chenille throw is now on the other side of the couch (closer to my feet). The basket between the sub-woofer and the entertainment center is going to my in-laws as part of their Christmas present and it's been replaced by a cool lamp from IKEA. And a set of hexagon-shaped nesting baskets -- also from IKEA, but no photo available -- is between the bookcase and the oval side table. Anyway, there's a lot of stuff over there and no space for the ginormous tree VPH and younger step-son brought home last year when I made the mistake of sending them to pick up a tree unaccompanied. Let me draw your attention to several items in the photo above. 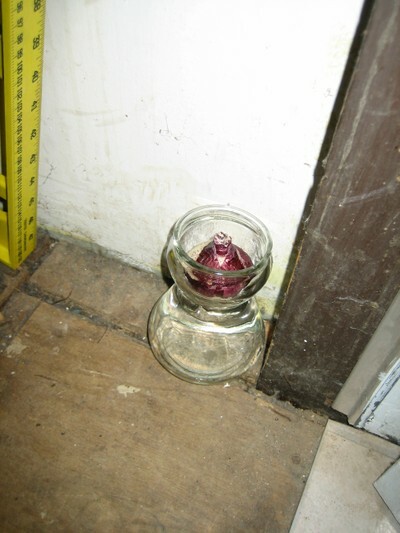 A great plastic tray under the tree that will prevent dirty water from staining the carpet. The left side of the pot is bulging because it's split -- easily repaired with some duct tape. 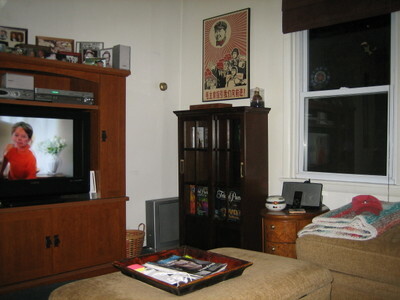 And see how completely not level my living room is that the door on the bookcase gaps on the bottom right. Luckily that is only visible when looking directly at the bookcase which we almost never do. 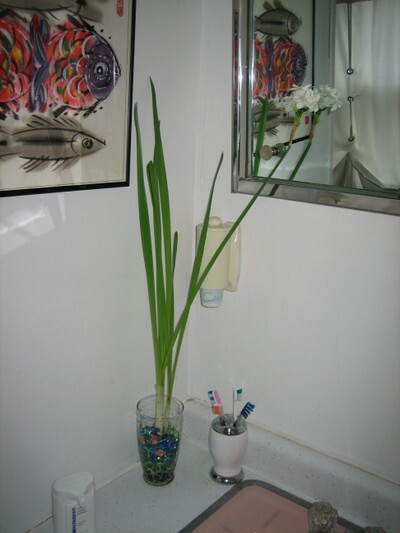 See the amaryllis tipping to the left? And the Bose docking station is now on top of the bookcase for the IPOD playing our many Christmas tunes. Isn't it pretty? 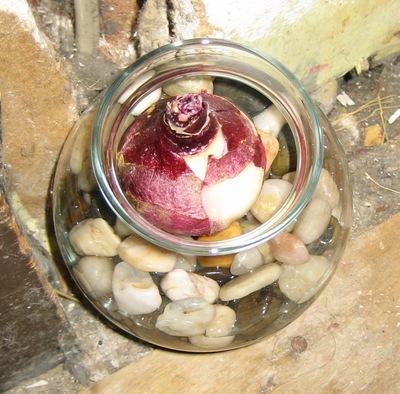 The amaryllis is now surrounded by black stones to help hold the stalk up straight. Everyone in our family has a special ornament that is supposed to indicate the side of the tree where your presents will be stacked. In reality, presents end up all over the place and it's a struggle to get the kids to put any ornament on the tree, let alone their "special" one. Ironically one Christmas I decided that we were too busy to do the whole tree thing and they nearly revolted. 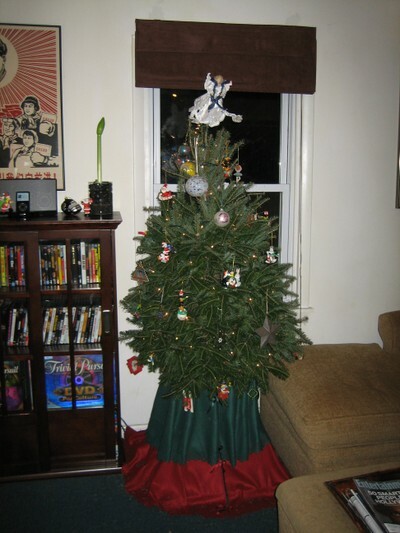 Why, oh why do all the men want a tree and then balk when it comes to decorating it? The ornaments on top of the bookcase are a Coca-Cola Santa for younger step-son and a Homer Simpson Santa stepping on a cat for older step-son. They also have ornaments of their favorite football teams, the elder favors the Raiders, and the younger the Jaguars. VPH is a Steeler fan and I guess I follow them more than any other team. That ornament is already on the tree and the boys will hang theirs when they come over next. Wondering what my special ornament is? The ballerina on the upper right of the tree. I've had it since I was a little girl. 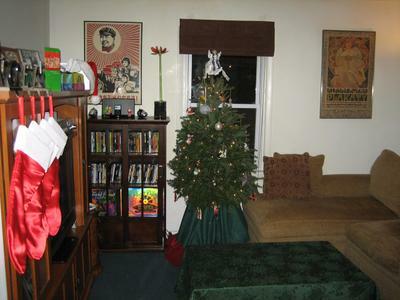 VPH's is the ceramic Santa riding a candy cane on the upper left, which he's also had since he was very young. 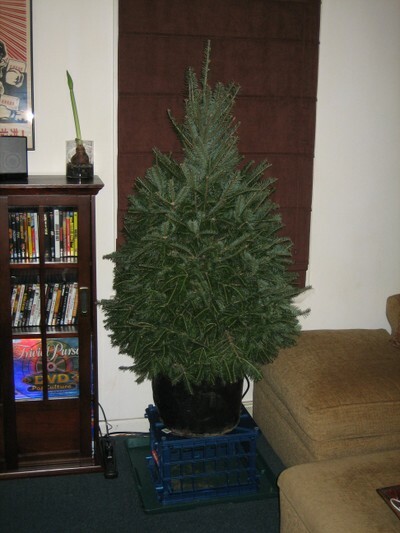 This is the earliest we've ever trimmed the tree and I think I like it. 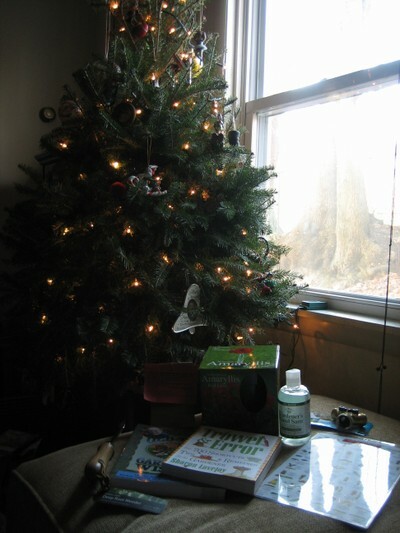 VPH insists upon taking the tree down on New Year's Day, so the earlier we set it up, the more bang I get for my buck. What kind of tree do you have? Do you have any special tree-trimming traditions? 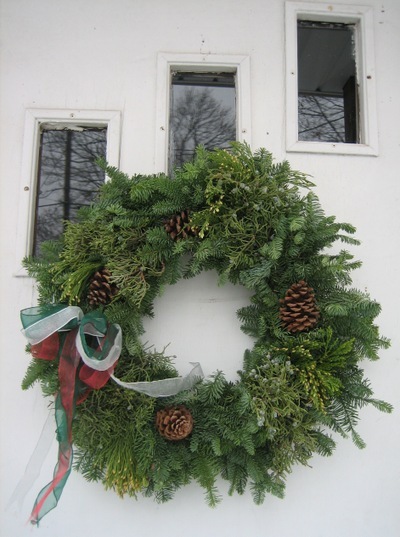 Are you in the immediately after Thanksgiving Christmas decorating camp or do you wait until Christmas Eve? There's snow in the forecast for Sunday into Monday so we have to get everything cleaned up and put away this weekend. I've obviously completely lost it. VPH and younger step-son are looking at me out of the corner of their eye wondering what the crazy lady is going to do next. 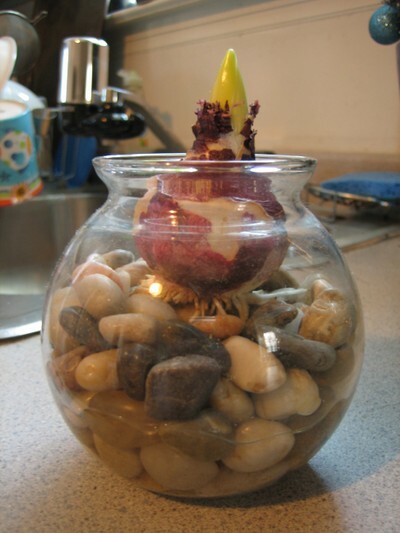 Why does she keep sticking gravel and glass pebbles in vases and glasses, throwing a bulb on top, and adding water? This is not normal behavior. Then she starts putting balls and sparkly snowflakes on the rosemary tree? Lunacy! I need to find a star for the top of the tree. It's so cheesy, but it's fun! Did you see VPH's new coffee maker above? The old one died a horrible death and I couldn't see making him wait 20 minutes for a pot of coffee to brew twice a day every day until Christmas, so it's an early present. 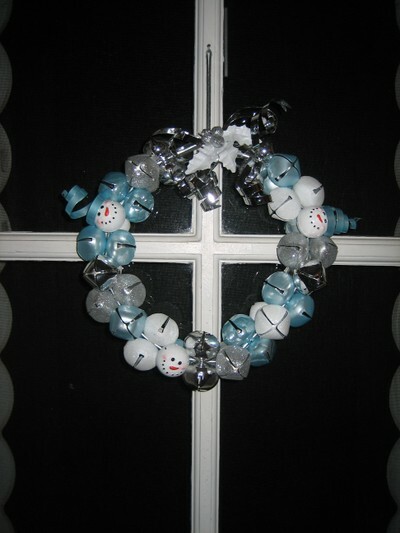 Did you find the snowman at the bottom with the missing blue metal hair swirl? I doubt anyone who is in my kitchen will notice it without prompting either. 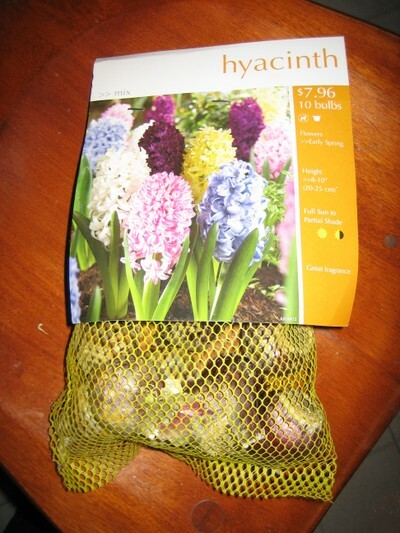 Okay, I am officially crazy about forcing bulbs. 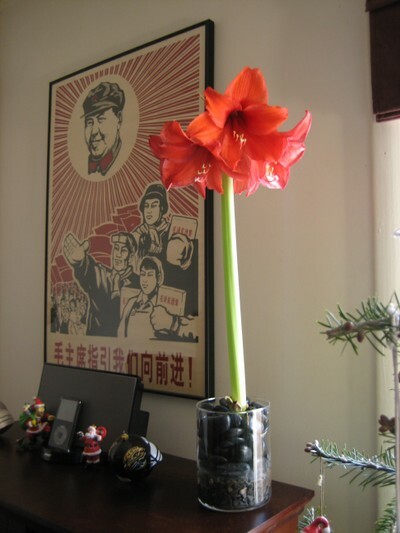 Wait until I post the latest photo of the amaryllis on Sunday, you won't believe how it's grown this week. 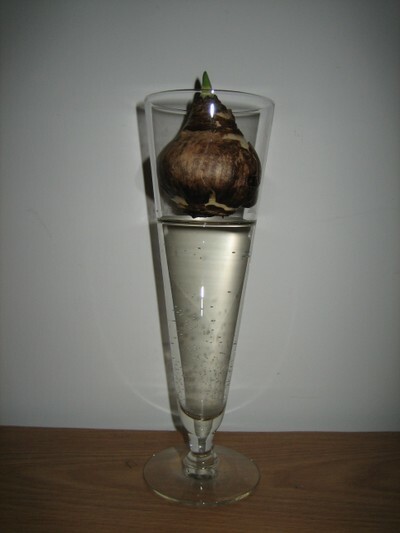 I've started a bunch of other bulbs now. I like the element of surprise here too, will they be blue, pink, yellow? Layanee, I love that you're so excited to read my new posts, you make me blush. I wish I could be disciplined enough to commit to posting on a specific day, but it's never going to happen! 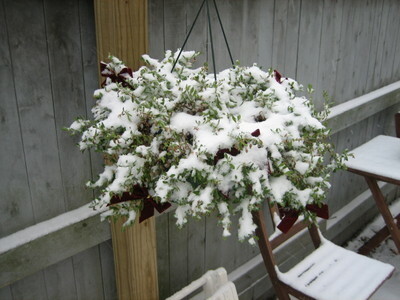 You other new garden bloggers out there -- how are you coping with not having much to post about now? Since it's turned bitter cold outside (4o feels positively frigid after 63 on Thanksgiving), I've turned to gardening indoors. 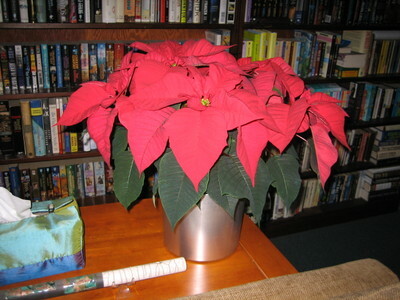 I've been a bit under the weather and lacking enough energy to dig out the Christmas decorations, but I did drag myself out to pick up a poinsettia on Friday. 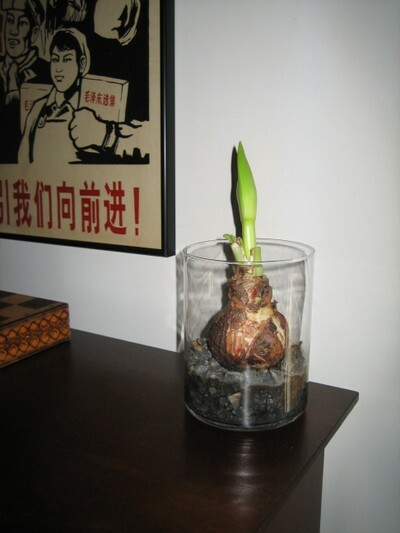 The amaryllis has really sprouted this last week. I can't wait to see it bloom. I'm enjoying forcing it so much that I picked up some paperwhite bulbs on Friday when I got the poinsettia and as soon as I feel up to braving getting off the couch, I'm going to get them started. Ignore the dirty dishes in the sink, VPH will kill me when he sees this photo. 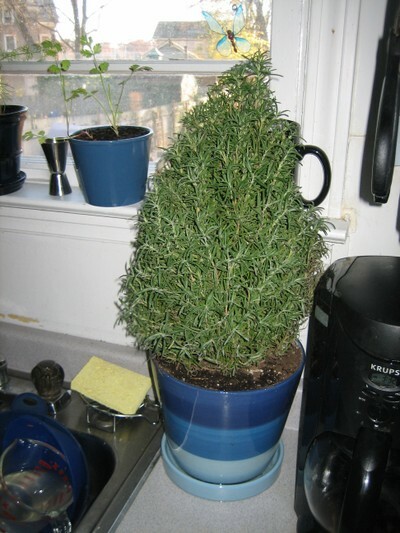 Too bad we don't have scratch and sniff internet, the rosemary tree smells amazing. 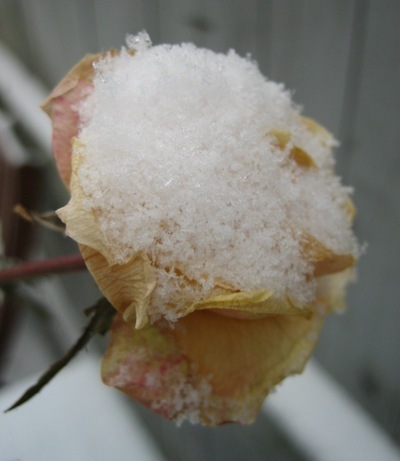 What are you growing inside this winter?